Are you curious about USB audio? What are the benefits, what are the downsides? Is the limitation of not having the standard 3.5mm stereo connector really worth it? Can you really take proper advantage of USB on a budget? 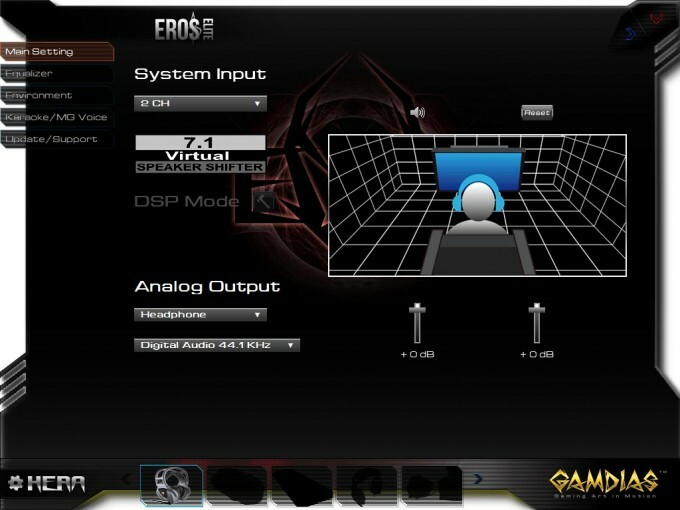 These are all questions I will visit in the review of the GAMDIAS Eros Elite EQ Surround gaming headset. Audio is not the easiest thing to review, after all, it is so incredibly subjective. My goal as your humble reviewer is to give you, the reader, the best possible description I can, without you being here with me to listen to these for yourself. Sometimes the most important part of reading a review about a product, is to know a little about the reviewer, their experience, what they are comparing these headphones to, and so on. I personally don’t own any super high end audio gear. I have a friend who is a voice over artist, and I have tinkered in his studio with various things. I have used different types of microphones from ribbon, condenser, electret and so on, with preamps and without, solid state, and tube. I have listened to many different high end headphones, most notably at this year’s CES; fellow Techgage staffer JD Kane and myself listened to a pair of $2500 Pioneer headphones, being played through probably as much as $2500 worth of gear before the sound even got to those headphones. Needless to say, they were absolutely amazing sounding, by every metric you can think of (besides budget of course). You can spend literally thousands and thousands of dollars on audio, and still have room to improve. It just depends on how discriminating your tastes are. Some people are fine with the stock ear buds that come with their smart phone. Some won’t even bother unless the headphones are reference quality, running a tube pre-amp with FLAC audio. I would consider myself on the more practical end of the spectrum. I enjoy great sound, but it also must be practical, and above all, affordable. This is certainly the difficult tasks that designers have when designing headphones. You have x to spend making these headphones, where do you spend it? Aesthetics, sound quality, comfort, how does one balance this, what is your target market? You have a finite amount of resources to make your headphones as great as you can, how do your headphones turn out? This is why you can find literally hundreds of different headphones on the market at any one time, because people’s tastes are so diverse. Personally, I covet sound quality and comfort over aesthetics. If I find the perfect (to me) sounding, most comfortable headphones, I don’t care if they have pink ponies on them, (okay, I might care about that) I am going to use them. There are a lot of people that will tell you why having a USB headset is better than the standard analog set, and vice versa. At this price point, all you are really gaining with having USB is having the logo illuminate on the side of the headset. There really is not a major advantage to having USB on a headset. Some audiophiles will tell you that it is best to keep the signal digital as long as you can, as analog is more susceptible to interference, but at this price point I don’t think this is really a valid argument. When it comes to design, I personally hold a maxim close to my heart, and that is less is more. When it comes to peripherals, I genuinely prefer muted, less flashy, more “mature” if you will, design elements. Often the flashy, gamer bling is just nonsensical to me. I know some of you out there are already yelling “You old fuddy-duddy!” at your monitors…and I may be just that, but I genuinely find gamer bling often times just tacky and gratuitous. 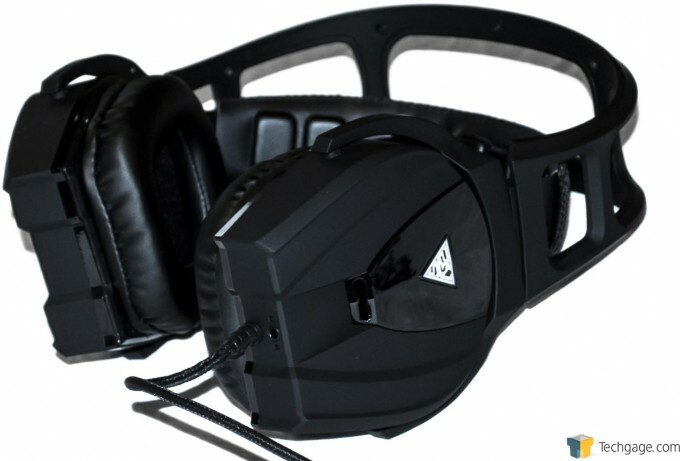 Having said that, I really like the way the Eros Elite EQ Surround headset looks. It’s subdued, sleek, premium, even elegant, albeit large and luxurious all at the same time, almost like a BMW 7 series. The headband is a two-piece design, with the top portion providing the semi-rigid structure, whereas the second part is the soft, expandable headband. As you can see in these pictures, the cups are large and plush. I have fairly large ears and head to match, and I found the Eros Elite EQ Surround extremely comfortable to wear. There was no break-in needed; they felt wonderful the first time I put them on. These cans stick to the industry standard of keeping the cord on the left side of the headset. The cable is made of the same braided material you would find on a high-end gamer mouse, although a bit more flexible than most of the mouse cords I have came across; this is a good thing as when you wear the headset, I found the cord to naturally rest in a favorable way, not stiff and sticking out and being in the way. About 26” from the left ear cup on the cord is the control pad. From here, you can control volume, mute the microphone, toggle the surround sound on/off, or toggle the “Bass” and “FPS” audio presets. The microphone is a boom design; its flexibility does allow adjustment, and is easily installed via a 3.5mm jack on the bottom of the left side of the body. On each side of the headset, you find the GAMDIAS logo, and that does illuminate amber when powered on. One area I have noticed that peripherals tend to fall short is their accompanying software. I will admit, I was not expecting a lot when I loaded up the software for this headset. The download was just over 26MB and came as a zip folder. The software once installed was actually really nice to use. The GUI is designed with an aggressive look, but still has a clean and fluid navigation. 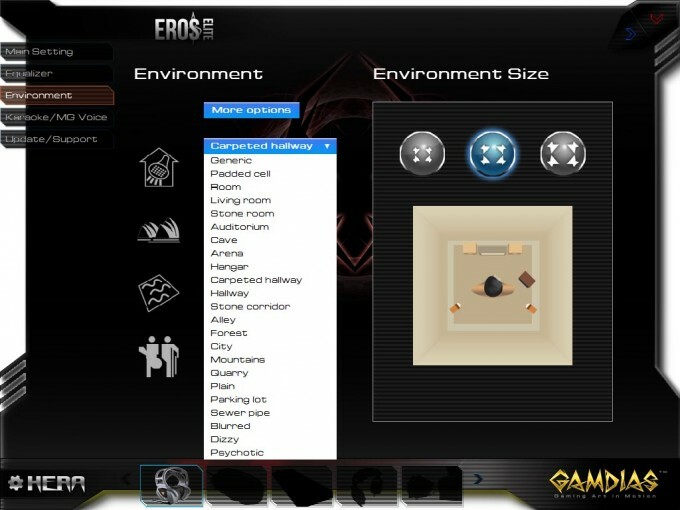 The first screen is the Main Settings. Here, you can select your system input, toggle the 7.1 Virtual Speaker Shifter, and even change the analog output from either the microphone or 2 speakers, and change the bit rate from 44.1 to 48KHz. The equalizer has 10 bands and works in the traditional slider fashion. There are also presets, but I found that I prefer to fine tune the EQ settings. The next screen shows “Environment” which simulates different acoustical environments. This was actually fun to play with. I see it as nothing more than a gimmick for my personal use, but it did work well. 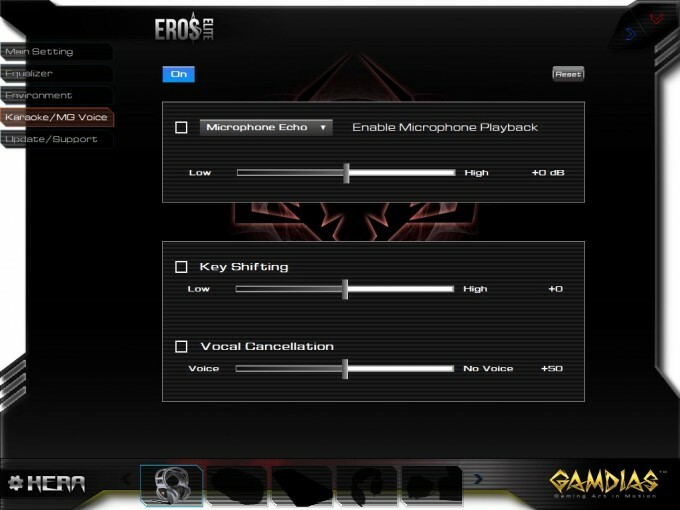 The next screen shows different settings for your microphone. Again, kind of a gimmick for me, but it might be fun to give your voice a certain sound for when you are gaming, to set yourself apart. 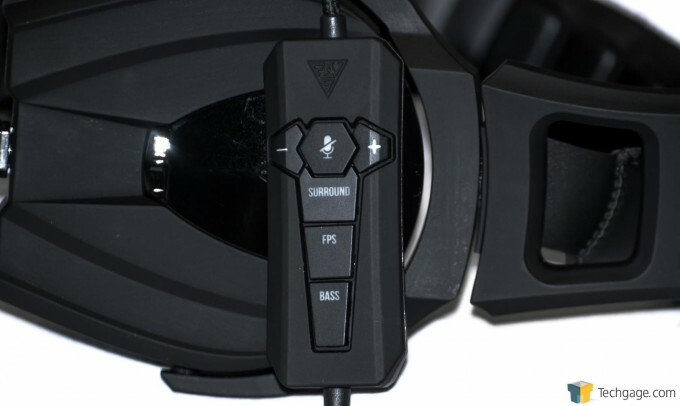 My first impression when I took the GAMDIAS Eros Elite EQ Surround Headset out of the package was “wow, these are light”. Something else that surprised me was how comfortable these were to wear. 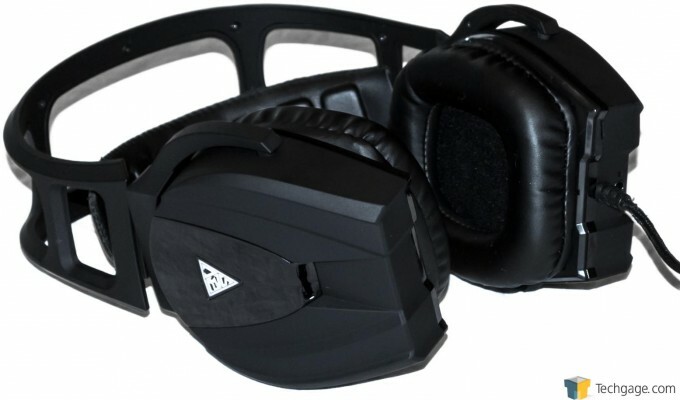 The ear cups are large and generously stuffed with soft padding. They quickly and effortlessly contour around your head, and feel very natural to wear for long periods. I did notice my ears got a bit more warm than I care for, but it was not bad at all, and something that is more or less unavoidable when wearing over the ear headphones. One part of the design that I definitely do not care for, and would encourage GAMDIAS to redesign, is the controller location, and the design of the controller itself. The controller is 26” away from the headset, putting it at crotch level when you are sitting down. I found myself bumping this occasionally, and changing the EQ settings, which brings me to another problem; you can’t save the EQ settings. I think this is an oversight, hopefully something that will be changed in an upcoming patch. I would rather there be a simple inline three way button like on smartphone ear buds, with volume up, down, and a mic mute button, and have it located just a few inches down from the headset. As I mentioned before, these headphones are very, very comfortable. I have a large head with large ears, and these fit me just fine, no complaints at all there. As far as sound quality, with these cans just plugged in and on default, they don’t sound bad at all, just a little on the flat side. If you toggle the bass button on the controller, it seems to overdrive the bass. If you are listening to Rap for example, I noticed a lot of compression, as the sound seemed to dip, and it cuts the highs off far too much, just a muddy, horrible sound. If you use the FPS button, you get a similar experience, but on the opposite end of the spectrum. The highs seem to dip out, and the lows just disappear. These two presets are far too extreme to be useful, which again brings me to wishing they would redesign the control, and remove presets as I find them gratuitous and poorly done. I tested out the simulated 7.1 surround and was disappointed, as I have been with every other set of surround sound headsets I have tried out. I just don’t think it is possible to accomplish this properly with headsets at almost any price point, but I could be wrong, I just have never heard any that impressed me. Overall for the MSRP of $79.99 on Amazon (or less direct from GAMDIAS), the GAMDIAS Eros Elite EQ Surround Headset is a very decent buy in my opinion. They sound decent just plugging them in, but when you tweak the EQ, they really begin to shine. 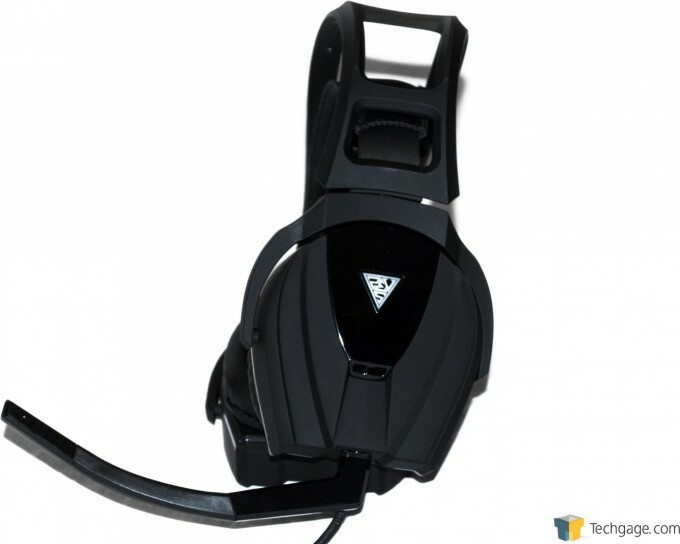 They have a very good range and serious presence, very powerful premium sound. I don’t know how GAMDIAS has made a headset sound this good at this price point, but I am impressed. I think the line does need some polishing however. 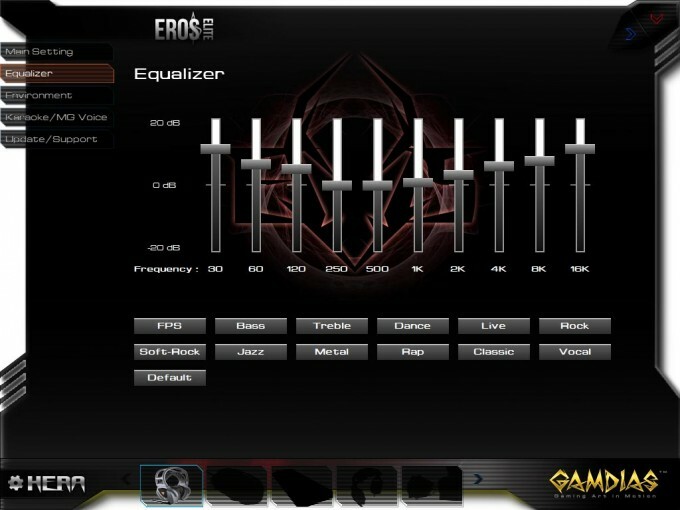 I would like to see the remote redesigned, and have the EQ presets either reprogrammable, or have the ability to save your own custom EQ presets, as I mentioned before. The microphone works great, and with the effects the software offers, you can really have some fun with this.